Cylinder vacuum cleaners are more compact than uprights, and typically easier to manoeuvre, a vital aspect of functionality if you have small rooms and need to easily clean around furniture. 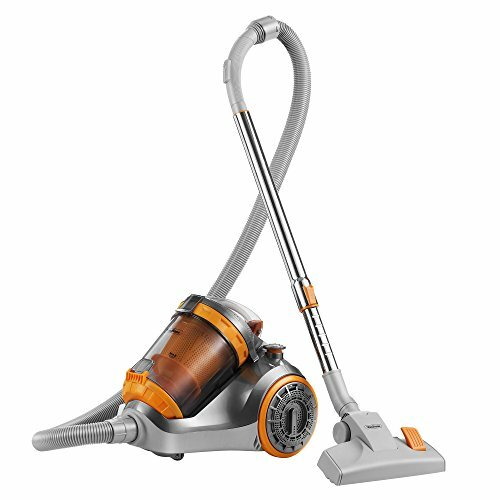 If you’re looking for a vacuum cleaner you can easily use on stairs, the cylinder vacuum, with it’s long frontal hose, is definitely the one you need to go for. It will also be light enough to pick up and carry up and down the stairs as you clean. Cylinder vacuums are good for apartments and hard flooring, as they are much lighter and easier to work with than most uprights. Most cylinder vacuum cleaners are bagless, but not all of them are. This is something to pay attention to when you’re considering a cylinder vacuum cleaner, particularly if it’s important to you to have a bagless vacuum cleaner. Bear in mind that bags for vacuum cleaners that need them can often be purchased online, and some bagged vacuum cleaners now have washable, reusable textile bags, ideal if your concerns are around the environmental impact of disposable bags. This is an ultra compact, bagged cylinder vacuum, which features a dual floor attachment for functionality on both carpets and hard floor. Despite this, however, it does perform markedly better on hard flooring. The bag on the Zanussi is somewhat difficult to change, and it isn’t particularly energy efficient – it is F rated for energy efficiency. Bearing all this in mind, this is a cheap vacuum cleaner, that would be well within almost everyone’s budget, and would serve well for someone moving into their first home, or as a back up vacuum cleaner. Considering the price, this would be a good vacuum for someone moving into their first home, or to have as a back up. This cylinder vacuum cleaner is a good price, if you don’t mind a bit of work changing bags. 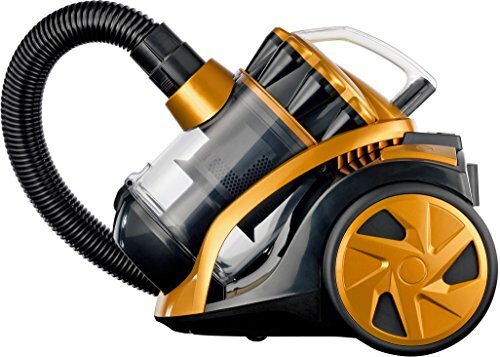 As its name suggests, this is a bagless cylinder vacuum cleaner, which features a 3-litre dust container and HEPA filter. The VonHaus also has a clear view display, so you can easily see when the dust container needs emptying. Despite its size, the dust container does seem to need need emptying more regularly than you might expect. The cord could do with being longer, especially for those with larger rooms, and this vacuum cleaner does loose suction in a relatively short space of time. The HEPA filter on the VonHaus would make it ideal for those with allergies, especially as there are no bags to change. The clear view display means you won’t be second guessing when the cylinder needs emptying. This is a fairly reasonably priced cylinder vacuum. The suction issue might be addressed by regular filter maintenance. If you have a small apartment, this would suit well for most of your vacuuming needs. Super micro HEPA Filtration traps up to 99% of micro sized particles to reduce allergens and fine particles. This vacuum cleaner features an optional pet turbo brush, which rotates as it cleans, drawing out hair from deep within the carpet. It is lightweight and compact, and A rated for energy efficiency. It does have a small dust collector, which needs emptying regularly, and isn’t good at picking up a lot of hair – it is more designed for refresh cleaning in between main cleans, or for people with cats, rather than dogs. This might suit someone with cats, or fine-haired dogs, who is keen to ensure that all of the pet hair is out of their carpet. This is a higher-priced vacuum cleaner, with somewhat limited functionality. It does have the backing of a big name, but there are more affordable vacuum cleaners on the market. This cylinder vacuum features a HEPA filter, making it ideal for those with pets or allergies. It doesn’t manage stairs all that well, but would be fine in a bungalow or single-level apartment. 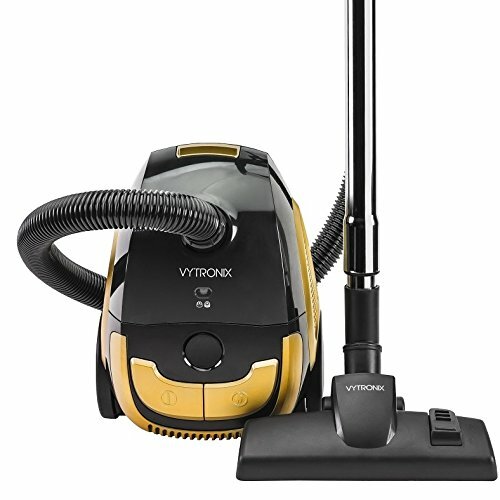 Also, it is one of the cheapest vacuums on the market – you could easily afford to buy a hand held vacuum along with the Vytronix, to give you full functionality if you do have stairs that need vacuuming. The Vytronix does have quite a small dust container, which needs frequent emptying. Dust container needs emptying regularly. This would be ideal for pet owners living in a bungalow or single-level apartment. 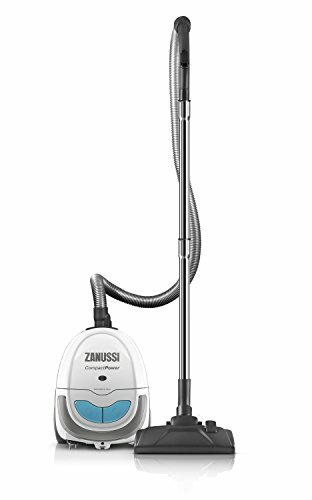 One of the cheapest vacuums on the market – definitely worth buying. This is a compact, powerful cylinder vacuum cleaner, with an accessible, easy-empty, front-placed dust container. The positioning of the dust container makes emptying and cleaning a breeze – just reach down, pop off, and you’re good to go. 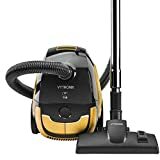 This is a very affordably priced vacuum cleaner, suited to anyone’s budget, although it would benefit from a longer cord. This vacuum would be an ideal purchase for anyone, from those setting up home for the first time in an apartment, to those with a long-established large house and busy lifestyle. 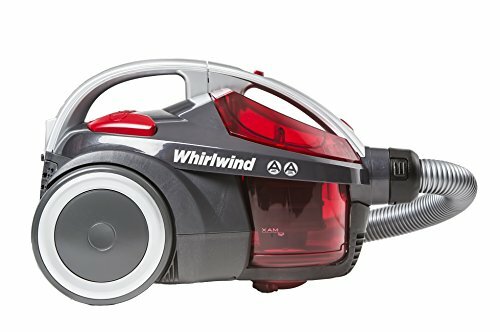 An affordable, good-quality vacuum. Definitely worth purchasing. Less frequent emptying due to the 2L capacity means cleaning is more convenient and less of a chore. Powerful 800W motor provides plenty of suction power with no drop in performance. Easy emptying method: the BGGC01 comes with a high-filtration disposable dust bag.